Making something out of nothing: more fantasies from the North End. The Coaster has once again uncritically reported on North End “news.” This time the “news” is emanating from the Ocean Grove Camp Meeting Association at the OG Home Groaners meeting on May 24, 2015. In the May 28 edition, the Coaster states that JP Gradone, CMA spokesman, said, “Neptune Township and Wesley Lake Village Enterprises (WAVE) are the developers.” This confusing statement requires clarification, but the Coaster just repeats what it hears and asks no questions. That is how it is. In addition, the OGHGA allows its podium for the repetition of nonsense with no indication that it asked any questions about the current revelation and how it would impact the citizens of Ocean Grove. A. There are only two agreements which are currently in force regarding the North End Redevelopment and they are both from 2008. 1. On March 24, 2008, the North End Redevelopment Plan (NERP) which contains zoning changes to permit condos, underground parking, etc. was officially approved by the Township Committee. 2. On June 9, 2008, a Resolution was passed by the Township Committee that named the OGCMA and WAVE as co-redevelopers. Nothing has happened to change either of these two agreements which currently remain in effect. B. The announcement by Gradone on May 24 regarding a change in “developers” is just talk until we see official Neptune Township paper work . Only the Township Committee may approve a new Resolution or a new Redevelopment plan. It is unclear as to why Gradone, a CMA spokesman, is announcing an action by the Township Committee. Nowhere do we find a resolution by the Township to become a “developer” at the North End nor do we know why such an idea would be considered. C. On April 27, 2015, Committeeman Randy Bishop (repeating a plan by WAVE) announced that a new redevelopment plan had been created which would reduce the density by 50%. But all he had was a conceptual drawing from WAVE. To change the NERP would require the Township Committee’s rescinding the 2008 version and then signing off on a new version, but that has not happened. It’s time for the Neptune Township Committee to speak to the people of Ocean Grove and tell the clear truth about where we stand now regarding the North End Redevelopment project and to explain why corners appear to have been cut during this process and why transparency has been lacking. 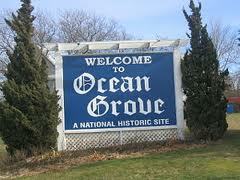 And it is time for the Ocean Grove Home Owners Assoc. to get tough and work to defeat the North End Redevelopment Plan and stop being patsies for the Neptune Township Committee. The North End Redevelopment plan is not good for the town and will lead it down the road to becoming Asbury Park South. What happened to Bishop’s promise that WAVE would release a list of all the investors? And what happened to the Redevelopers agreement that was supposed to be signed by the Township and WAVE? Doubting Thomas: I honestly believe that the Township Committee after approving the NERP has no clue about what is going on in preparing for the project. In my opinion, the project is being orchestrated at some higher level than the Committee. I think the Camp Meeting Association just had the good sense not to have any part in the development stage of this apparently illegal project. The OGHOA coordinates the news releases. The Coaster reports the misinformation. Blogfinger does the most accurate reporting, but it would take the FBI to get to the bottom of this. I know that the Ocean Grove Camp Meeting Association can not continue to pay taxes on the North End property and putting them further in debt. Since this is such a important piece of property to Ocean Grove, this must be developed the correct way or this can have significantly negative consequences to the town and its residents of Ocean Grove. This includes jeopardizing the quality of life and the historical value of the town. If this project is not watched closely by the residents and OGHOA, this could cause permanent damage to our town. Also, the potential contractor of this development does not have a good track record in Ocean Grove and we do not know who are the WAVE developers. Please remember this has been declared a blighted area (i.e. “an area in need of redevelopment”) and that this designation gives the developers and the constructors much more freedom to do what they want with this piece of land. The residents need to go to the Township meetings that effect this issue Township Committee meetings, planning board meetings and HPC meetings). I am hoping that the residents follow this project closely and become an active voice in what happens at the North End Boardwalk area. Since Sandy, part,or most of it, is now in the coastal floodplain and high wave risk area. It also has a very high water table, Wesley Lake doesn’t refill simply from storm runoff. I would think any development plan created before that storm would have to be completely scrapped. I agree with Oh My. I would think that they would have to submit a whole new plan post-Sandy. The Pavilion at 4 boardwalk was completely wiped out until they scrambled to close it up without permits They knew that they would not be able to rebuild this building under the Cafra and DEP rules because it is right on the beach and close to the lake outflow pipe. They should be forced to resubmit a whole new plan under these circumstances starting from Square one. EDITOR’S NOTE: This commenter uses the term “they,” but doesn’t explain who “they” is/are. I will allow this comment because it raises the issue of coastal regulations, but it would be better if the commenter would tell us who he/she is talking about. CAFRA refers to the New Jersey Dept. of Environmental Protection’s (DEP) Coastal Area Facility Review Act. If any of you out there have expert knowledge about these coastal DEP regulations as to how they might have been changed after Sandy and how such changes might impact the proposed redevelopment of the OG North End, then please let us know. As far as “resubmitting a whole new plan,” our articles have made it clear that an actual detailed plan including engineering studies were never done because, even back in 2008, all that the NERP consists of, to 2015, is a conceptual design created by a planning firm. The redevelopers (WAVE and CMA) never went ahead with a formal Redevelopers Agreement or with detailed construction and engineering plans. If the Township wants a new plan now, they would have to go through the whole process again which began in 2006 and consisted of many public meetings and hearings and presentations. If you read the NERP document, you can see what had been done to produce that preliminary conceptual product in 2008. Jack Bredin – I think you’re right. It is difficult to get to the bottom of all this……not sure if even the FBI would be successful….. too many layers. (But don’t ever lose your interest and commenting on all this). It’s enlightening. When I am referring to “they” I mean WAVE the developers. In 2015, the CMA also announced a new plan, but it never happened. Read this post and look at the paragraph quoting the State Redevelopment and Housing Law regarding”new” plans. Sound familiar?